what bridge will work best? I'm kinda leaning toward the tele bridge because it will require the least effort to install, is a top loader, and offers the most range for intonation, BUT the lp jr wraparound will probably look a lot better... is there another option I'm missing? Oh, and also, will the wraparound even work on a fender type guitar? the tele one would be easier to do and would look better I think. also, GFS sells these for cheaps. 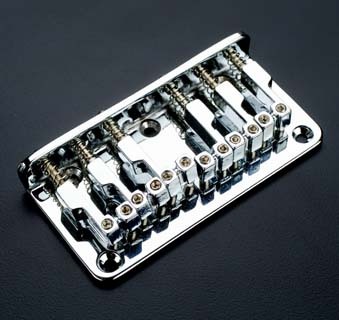 Don't they have a strat tremolo to hardtail conversion bridge now? I saw one on a guys strat at a memorial show. It looked like a regular strat trem except it didn't have a trem bar hole and it was somehow bolted in. Yeah but that's not a direct drop in IIRC. I have some pics somewhere of mine that I'll try to find. Side note, anyone know if GFS sells those saddles separately? It's impossible to find offset saddles that fit on those Smith-era Strat bridges. Hell, for $12 I guess it's worth just buying the whole bridge. I tried to find a strat hard tail conversion bridge for a while and there was one at some point but they went outta business. I ordered the gfs one I'll let y'all know how it works next week! I've used the cut-off Wilkinson bridge on three of my Super-Sonics. I use wood plugs that I custom-make. A Whole Bunch of Guitars. Some with sparkles. Some with Pearl. Some with racing stripes.